Please Contact Me to order any of my Existing Designs, or to inquire about a Custom Design from the digital image of your choice. Every piece is created individually, and production takes several weeks. The Frequently Asked Questions below will give you more detailed information regarding purchasing. What is the price for an Illusion Knit ? There is a flat fee for setup & finishing. The setup & finishing fee is $120, and includes the first hour of design time. (If you’re ordering an existing design, there is a discount of $40, so the flat fee is $80.) The included hour of design time is normally sufficient to prepare a single image for knitting. Additional design time, if needed, is $80/hr. There is a custom fee for each piece, based on size. Size is the dimension of the image in pixels. I’ve provided a formula below into which you can plug your numbers if you know the size of the image you’d like me to use. But don’t worry, I’ll help you with all of that when we discuss your order. You can order your piece as fashion fabric (unframed), or framed. Framed pieces are stapled to stretcher bars and backed with fabric. This is suitable for hanging. Additional framing treatments are left to the customer. Framing fee, labor & materials, is $11/linear foot of frame. Cost of materials. Based on your fiber content and color preferences, cost of materials begins at $20 for a small piece in acrylic yarn, from in-stock colors. Custom colors or fibers will be priced at cost. Custom Designs : Can you make an Illusion Knit of my child/spouse/dog/cat/car/logo/etc? Yes! I can create an illusion knit from most digital images. Some are better suited than others, and the fewer objects in the image the better it will look. I am happy to give you an estimate and some examples of what the finished product might look like, using my Illusion Knit simulator. How small or large a piece can you make? At present, the equipment I am using knits with yarn approximately 1–2mm thick, or about the thickness of a CD. This yields 6-7 stitches and 10-11 rows of knitting per inch. I can knit up to 200 stitches on a panel (all panels are knit side-to-side, so 200 stitches is the max height.) Thus the maximum height of a piece is 28–32 inches depending on the size of yarn used, and whether the piece is stapled to stretcher bars, or left as fashion fabric. There is no theoretical limit to the width of a piece, though the illusion effect is gradually reduced as the piece gets wider. I’m happy to describe this more in conversation if you’re interested in a very wide piece. It is possible to combine panels to create a taller piece, to cover a portion of a wall, for example. So, in short, maximum height is about 32” and there is no real maximum width. As far as minimum size, this is really determined by the image. 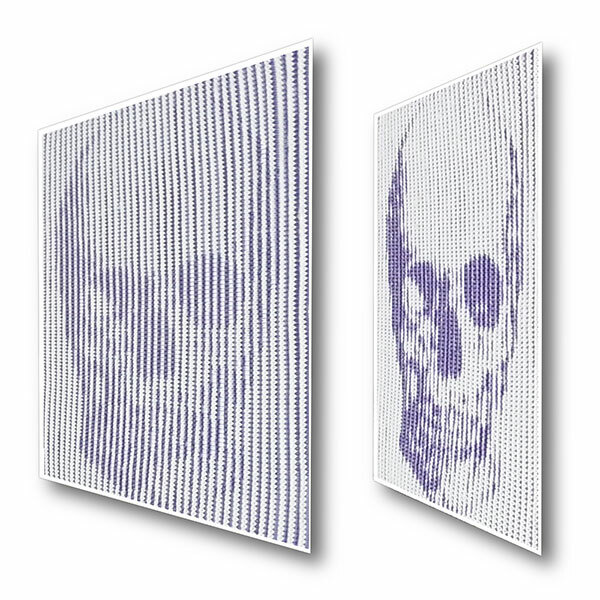 Since each stitch is the equivalent of one pixel of the image, the smaller the piece, the lower the resolution. At some point the image looses so much resolution that it becomes unrecognizable. The Skull piece is 109 stitches tall, Vitruvian Man is 200 stitches tall. I’m happy to work with your selected image to provide a few examples and make suggestions about the best size. The determining factors are yarns of the correct size that are available to me, and a high contrast between colors. Again, I can use my simulator to provide examples of any piece in different colors. Sometimes the best is simple black and white, but I’ve tried to provide a range of knitted examples in my gallery to give you some ideas of what the Illusion Knits look like in different color combinations. Shipping costs depend on whether the piece is shipped as fabric, or as framed art. Fabric will be shipped at boxed USPS rates. Framed pieces will be shipped through a local art shipper and I will obtain quotes for individual pieces. Return Policy: You may return any piece that is made from an existing design for a full refund of the purchase price, less shipping charges. All sales of custom designs are final.